This beaded window hanging crystal prism suncatcher is an easy craft and gift idea that kids and adults can make with fishing line and pony beads, glass beads, or Swarovski crystal beads. Place hanging hearts in windows to cast beautiful rainbows around the room with your hanging prism suncatcher. You can also use suncatcher prism crafts as pull chains for lamps, shades, and fans. 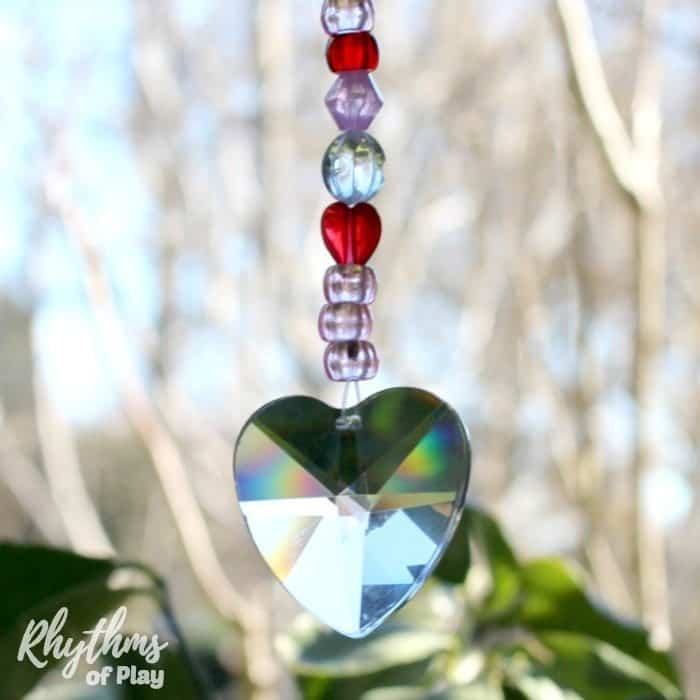 A DIY suncatcher prism heart makes a great homemade gift idea for Valentine’s day, Mother’s Day, Father’s Day, Christmas, a birthday or, a wedding or an anniversary! 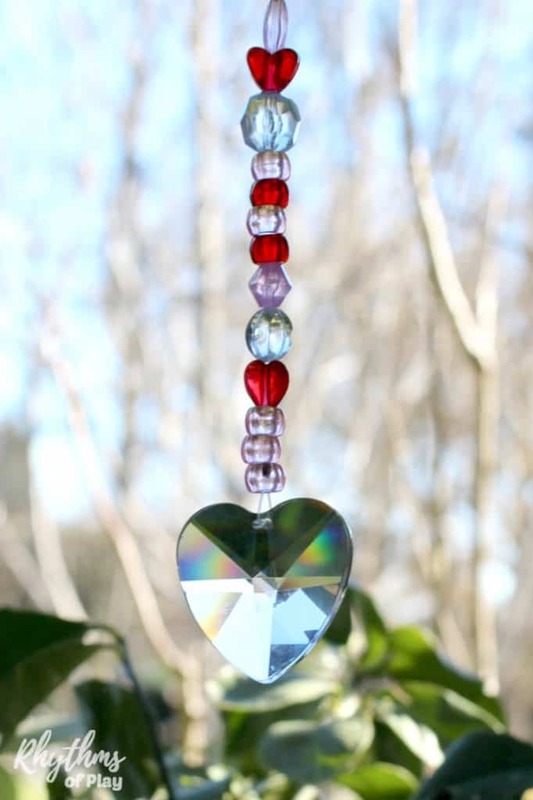 There are two ways to make a heart prism suncatcher. One method uses a plastic needle while the other uses crimp tubes and crimping pliers. Don’t worry, crimping pliers are inexpensive and simple to use. This article contains directions to make it easy. You can find the directions for making this with a plastic needle in Pony Bead and Prism Suncatcher. The plastic needle is used to make it easy for young children to make but is not necessary for someone with more developed fine motor skills. You can follow the same basic directions without using the needle if you don’t want to invest in crimping pliers. If you use the needle method you will only be able to string basic pony beads. The needle is too big to fit into the smaller openings of other types of beads. For this project, I started and finished the suncatcher while my 3-year-old daughter strung all of the pony beads onto the line. She’s had a lot of fine motor practice so she no longer needs to use a plastic needle. Transparent pony beads and/or mixed heart pony beads , and/or faceted pony beads. If you won’t be working with children and pony beads aren’t your thing, try using glass beads, and/or Swarovski crystal beads. To see some amazing options click on the links below. 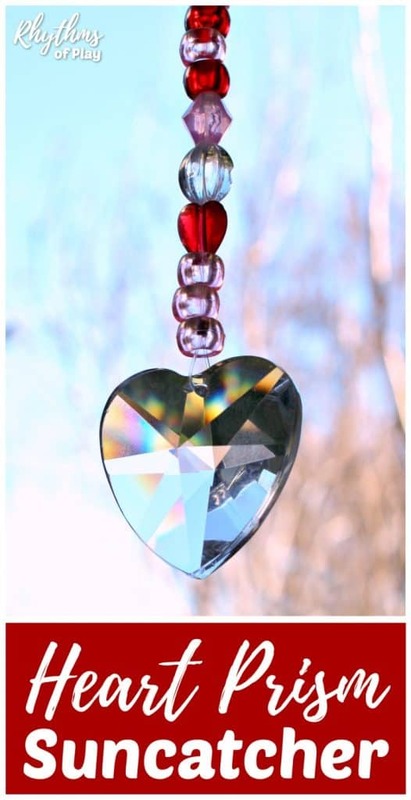 Follow the easy step by step directions to make hanging heart suncatcher prism crafts. You can see each step in the suncatcher prism photo tutorial below. Cut a section of monofilament line about twice and long as you will need. Place a crimp tube on one end of the line. Place the heart prism on the monofilament after the crimp bead. Tuck the short end of the line into the crimp tube next to the long end of the line. Push the crimp tube towards the heart. Use crimping pliers to squeeze the crimp tube shut around both pieces of the monofilament line. 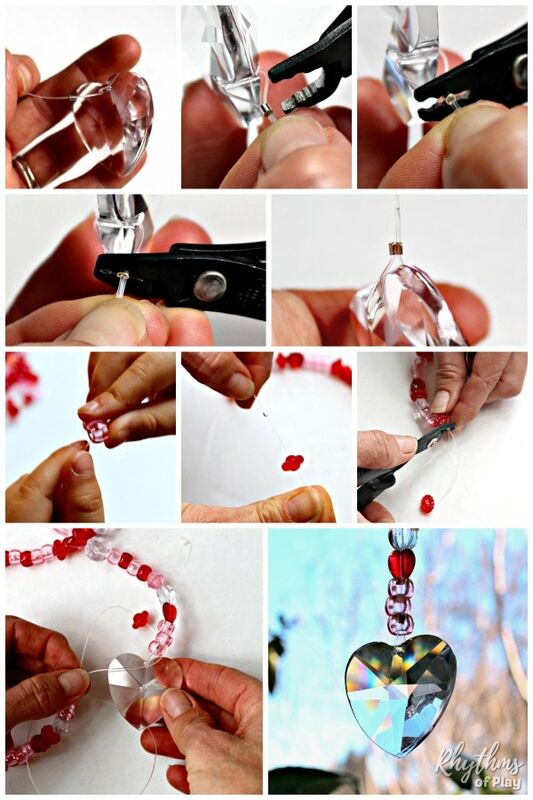 Use scissors to trim off the excess line if needed. String pony beads onto the long end of the monofilament line. There are so many fun ways to do this. You can use one color, two colors, or as many colors as you like. You can put them on randomly, or you can make a pattern. My 3-year-old daughter did a little of both for the suncatcher prism shown using various pony bead shapes and sizes. To finish: place a crimping tube onto the line followed by a pony bead. The pony bead will ensure that the rest of the pony beads don’t slip off of the loop. Slip the other end of the line into the crimping tube. Make sure you make a big enough loop for the heart to go through. This will make it easy to loop it through to hang your suncatcher prism on a curtain rod if desired. Use crimping pliers to squeeze the crimping tube shut. Cut off the excess line and enjoy your masterpiece or gift it to a loved one! 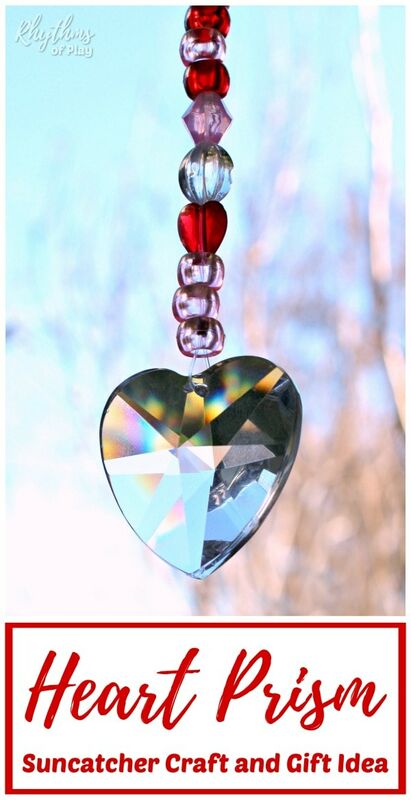 Heart prism suncatcher crafts look gorgeous hanging in windows, but also make wonderful pull chains for lights, shades, and fans. 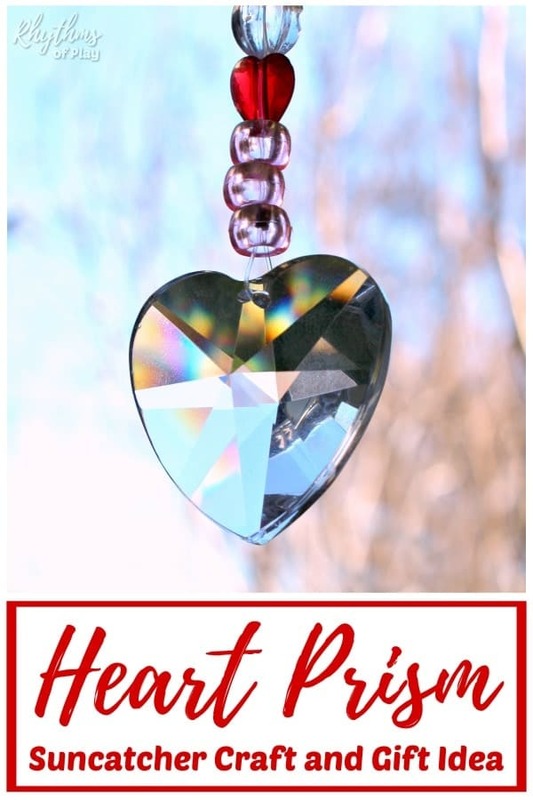 A DIY suncatcher prism heart makes a great homemade gift idea for Valentine’s day, Mother’s Day, Father’s Day, Christmas, a birthday or, a wedding or an anniversary! Another fun heart craft that makes a great gift idea are these fun thumbprint heart glass magnets and thumbprint heart necklaces. You might also like these cute hand-sewn lovebirds! Learn more about Rhythms of Play HERE.